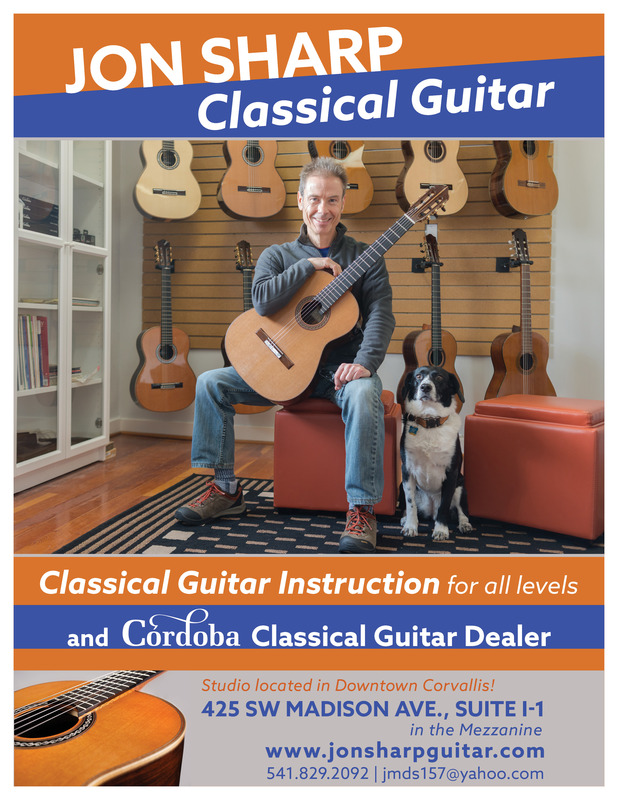 Posted in: Corvallis Guitar Society, Events. We kick off the New Year with the first Guitar Society meeting of 2019 welcoming Oregonian DAVID TUTMARK as our featured artist. David is a classical guitarist actively performing in the Pacific Northwest and is known for his visceral yet polished style of playing, and consistently delivers captivating performances of traditional and contemporary classical guitar. Join Cameron O’Connor and the OSU Guitar Ensemble for an evening of both large and intimate chamber works featuring arrangements of Handel, Bach, Faure, and more! Looking forward, the Guitar Society is taking a break over the summer and we will get back together again at the September Guitar Society meeting. At that meeting we will re-start the open guitar ensemble in Sept where EVERYONE is welcome to bring their guitar and join in. The ensemble music will be posted to the website one week ahead of the meeting – download the scores and decide which parts you might like to play, print them out and bring to the meeting. We will be working towards a winter guitar concert that will feature the ensemble and we will practice the pieces at each subsequent meeting. It’s okay if you chose not to be in the concert – still bring your guitar and join in! 7:05 – 7:35pm Open Guitar Ensemble: check out the music and download from the website one week before the meeting. 7:40 – 8:10pm Open Stage: share your music with us – all solo guitar styles (or ensembles) and all abilities welcome. All festival events will take place at the 1st Presbyterian Church downtown Corvallis: 114 SW 8th St.
1:00 – 2:00pm Workshop with Cameron O’Connor & Tom Strini: Exhibition and demonstration of historically significant and famous guitars from an anonymous private collection. Join moderator Tom Strini and performer Cameron O’Connor for a discussion on the development of the guitar through showcasing a 100-year span of instruments from builders Ramirez, Hauser II, Romanillos, and Elliot. 2:00 – 3:00pm Workshop with Berto Boyd & Grant Ruiz: How to play Flamenco Rumba: Learn to play the popular 4/4 rhythm from Spain. Students will learn basic strumming patterns & techniques with an introduction of how to improvise over the chord changes. Bring your guitar! 3:15 – 4:15pm Workshop with Mickey Jones: Practice Techniques for the Hands and the Mind: An introduction to practice approaches that will help the guitarist get the most out of their practices by addressing focus, concentration, problem solving, and musical imagination. Appropriate for all levels, bring your guitar! 4:15 – 5:15pm Workshop with Mario Diaz (of the Oregon Guitar Quartet) : Musica Costeña: An introduction to the instruments and different musical forms from the coast of Peru. We will break down the respective rhythms and accompaniment techniques in Landó, Festejo, Marinera and more. Bring your guitar! I am very excited to announce that Duo Tenebroso from Portland Oregon will be our featured artists at the meeting. Duo Tenebroso is known for their warm musicality and singular interpretations and combines the powerful playing and excellent musicianship of David Franzen with the award winning Kristen Waligora whose playing has been featured on NPR around the country as a champion of the emotional and expressive qualities of the classical guitar. They will be releasing their debut album “Portrait” on May 30, 2018, which features the World Premiere recording of “La Danza Grotesque” by American composer Alexander Liss. The album also features new transcriptions for guitar duo of the five movement work “La Humana Primavera” by Spanish composer Víctor Carbajo as well as “Prólogo” from his work “Antígona.” Other music featured on the CD is music by Steve Reich, Sergio Assad, Érik Satie, Antonio Vivaldi, and Domenico Scarlatti. This sounds like great program and I am very much looking forward to hearing them play. I am also very pleased they will be conducting the workshop to open the guitar society meeting! Posted in: Corvallis Guitar Society. The first meeting of the year will be Monday January 8th 2016 (because the first Monday is January 1st and therefore a holiday). Following the great ensemble performance by members of the Guitar Society at the Winter Concert, we are taking a break and changing the meeting format for a couple of months. In January we are going to offer a guitar workshop for people to join in and enjoy, and extending the open stage. Saturday February 17th 3pm Corvallis Library Winter Guitar Concert Series featuring Jon Sharp classical guitar, and Soprano Rebecca Fromherz. Concert featuring classical guitarist Cameron O’Connor and pianist Hui Wu. Guitar Festival Weekend of June 8th and 9th. Following the success of our first festival in 2017, we will be presenting Corvallis’ Second Annual Guitar Festival in June 2018. His Master Class Saturday morning was very insightful and I would like to thank local students Devon, Nathan, Paige, and Raven who took to the stage to perform for Adam during that session. The workshops that were free and open to the public on Saturday afternoon were very well attended and people relished the chance to learn from some of the great local teachers & performers we have in Corvallis including Mickey Jones and Berto Boyd. And rising star Jaxon Williams, an Oregonian and Fulbright Scholar who opened the festival for us on Friday night with a wonderful performance and a great program, and shared his insights into what makes him so good with our workshop attendees. Thank you Jaxon! We were very pleased with the turnout which surpassed our expectations and more so with the tremendous enthusiasm expressed by everyone who came. I would like to express my gratitude to the Benton County Cultural Coalition whose grant made this event possible as well as to our sponsors Shelton Faretta Guitars, Cordoba Guitars, Jon Sharp Guitar and Tom Strini. I would like to thank Wayne and Lily from Hilltop Music, Phoenix Oregon, who displayed wonderful collection of fine instruments, current and historical, for our festival including a Hernandez guitar from 1922. And finally thank you to our Board members for the hours of hard work they put in voluntarily. We are already looking forward to the Second Corvallis Guitar Festival!